"There are many ways up the mountain, but each of us must choose a practice that feels true to his own heart. It is not necessary for you to evaluate the practices chosen by others." - Jack Kornfield, "Take the One Seat"
If you want to start an argument in today’s health and fitness world, just put together a sentence that includes the words food, diet or nutrition. As soon as that statement escapes your lips or your laptop, someone will step forward to attack you for being immoral, cognitively challenged or a mindless dupe of the agricultural-industrial complex. Within minutes, even seconds, your premises and your character will be called into question. If you dare to make a health claim, your presumptions, data and sources will be attacked. Everyone has an opinion about nutrition these days and no one seems shy about imposing it on others or attacking nutritional philosophies that differ from their own. Militant vegetarians like to emphasize their moral superiority with the phrase “Meat is murder.” Not to be out-quipped, Paleo enthusiasts counter that “Wheat is murder.” In fact, many pro-meat militants seem to take intense pleasure in ridiculing the health claims, moral arguments and intelligence of vegetarians. Make no mistake; I am quite familiar with the power of diet to influence health and I am also well aware of the fact that food choices have powerful ripple effects that extend far beyond the plate and the table, all the way to public health, habitat and climate. But still, why this near-religious fervor around food? And why are we so quick to attack other people’s ideas and choices? Food, formerly something to nourish and sustain us on the grassland, has now become a focal point for argument, judgment, prejudice, and fundamentalism. But the folly of our dogmatism becomes obvious as soon as we look into the real lives of real people making personal food choices. Take the life of Jane Goodall for example. Ms. Goodall has been a vegetarian for decades and is also a highly influential activist for a healthy and sustainable future. Born in 1934, she is now 78 and travels the world, speaking out for sane environmental action, habitat preservation and education. At last check, her health was good. Millions of people, myself included, take inspiration from her life and her work. But according to the strident voices in Paleo diet circles, Jane Goodall is a fool. Her food choices are catastrophic for her health. By depriving her body of animal protein, she's promoting disease and compromising her performance. Without adequate nutrients, she is certain to die an early death. If only she would start eating meat, she would be happier. But even more important, we would be happier. And it’s not just Jane Goodall by the way. Other famous vegetarians include Plato, Mahatma Gandhi, Albert Einstein and Leonardo da Vinci. Are we to suppose that these people would have been more effective, happier or healthier if they had just eaten more meat? Don't be ridiculous. 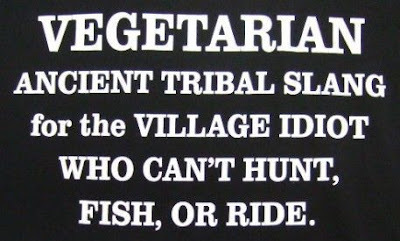 The vegetarian-carnivore shouting match has become a polarizing and destructive noise machine. And all sides seem to miss the big picture. That is, food is an incredibly complex subject with many layers of meaning. It is physical, personal, cultural, emotional and spiritual. Food has genuine health effects to be sure, but humans do not live by biochemistry alone. We are omnivores by evolution and nature, but the body is incredibly resilient and can thrive with many different kinds of diets. This, in large measure, is why humans have been so successful. Modern food presents us with a host of excruciating moral, health and environmental dilemmas, but these dilemmas will not be solved by vitriol, bile, dogma or ridicule. They can only be solved by well-informed individuals making good choices in their course of their daily lives. As trainers and coaches, our job is not to destroy the opposition. Rather, our job is to learn, educate and inspire. If you’ve discovered a formula for eating that balances the competing demands of health, morality, sustainability and pleasure, then by all means, practice that formula. But don’t assume that your formula is right for everyone else. Important as it is, food is only one dimension of a healthy life.